Invite your friends and family to the best comp of the year!!! Moving on to more cheerful matters, MichComp is here!!! 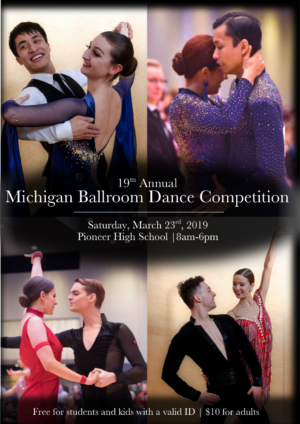 Anna has been working hard for months to put on an amazing comp for us, but MichComp will only be successful if it is a full team effort so please make sure you assist her in any way you can! Shoutout deadline extended to Wednesday! You can purchase a shoutout in the MichComp program for your partner, BFF or favourite graduating senior here. Housing: We’re still short of housing, so please volunteer even if you can host just one person. Sign up here. Set-up/clean-up: Half the team will be assigned to set up on Friday, and the other half to break down after the comp ends on Saturday. Assisting at one of these times is mandatory, keep an eye out for an email from Anna later in the week with your assignment. Get hype for Dance Mix! A-team have been hard at work all semester putting together a Latin formation for Dance Mix, the coolest dance show on campus! Come out to the Power Centre at 7pm on March 29th to see a selection of U-M’s best dance groups perform a variety of acts ranging from ballet to hip hop to Bollywood. Check out the Facebook event here for more details. The show usually sells out a few days before, so if you’d like to come I strongly recommend you buy your ticket in advance. You can buy your ticket at this link, from MUTO in the League, or at the posting wall March 25th-28th 10.30am-4.00pm. 9-11pm: Rounds in CCRB 3275 – come and get hype for MichComp with your teammates! 9.30pm-2am: MichComp afterparty! See the WAG email for the address. I can’t wait to be out on the floor competing alongside you all at the best competition of the school year! Regardless of how the scores turn out, do not forget to celebrate how much you have grown throughout the course of your time on the team this year, and to make the most of every second out on that dance floor!